From its long history of stress measurement in sedimentary strata Sigra has definitively shown that its tectonic strain model describes the state of stress in 70% of cases, the other cases being complex due to active faulting, unconformities or extreme folding. The tectonic strain is the lateral strain to which a sequence of strata are subject. It is derived by measuring the stress at various depths in the sequence and then subtracting from these the lateral stress that would be caused by the self weight of the rock mass above in a zero lateral strain environment. This is a function of rock mass and Poisson’s ratio. The remaining horizontal stress is that caused by tectonic effects. The values of these varies depending on the stiffness of the rock in question. It is generally found that the tectonic strain is even or varies monotonically through the sequence. The shallower values of tectonic strain frequently reflect local structures such as faulting and folding and may not reflect tectonic plate effects. 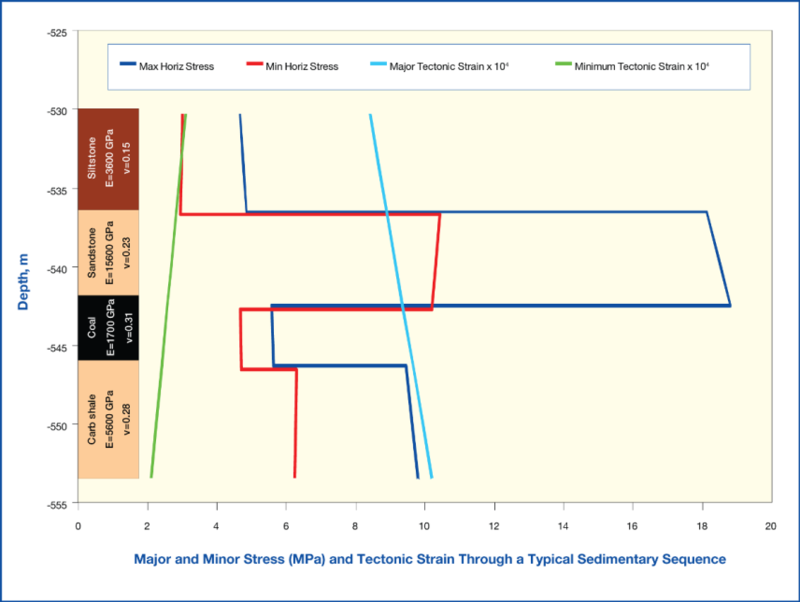 Sigra has on several occasions produced regional stress distribution models based on data from numerous sources, including those undertaken using its IST overcore tool, hydrofracture testing, and borehole breakout information. This information has been interpreted using the tectonic strain model which has been found to be adequate in the majority of cases. However in some instances the tectonic strain model is complicated by faulting. In these instances Sigra has used seismic information to examine the faulting regime and to interpret the variations in the stress regime on a regional basis. Sigra can compare these interpretations with numerical models, which may contain faults and which are gravitationally loaded, followed by the application of representative tectonic strains. Unloading behaviour through erosion may also be modelled. Figure 1. Example of changes in seam effective stress with a high shrinkage behaviour ; stiff coal with a sorption of 2.9 MPa. The upper two curves (red and blue) indicate the range of the major horizontal permeability while the lower two curves (black and mauve) indicate the range of the minor permeability. Sigra can model the effects of effective stress on borehole stability. This can be used to determine whether a borehole will fail during drilling or production. It may also be used in the interpretation of the stress field from borehole breakout information. The level of model that Sigra can use for this purpose varies from a straightforward analytical model of stress around a circular opening in an elastic media, to that taking full account of the stress strain characteristics of the formation into the post elastic range. In practice the latter model is seldom justified. Sigra uses limit state models to assess most slopes. It is found that these give adequate solutions, and that the additional effort in using finite element analysis is seldom justified. The two dimensional limit state soil slope model is based on a Janbu type solution. It is supported by a three dimensional version, which is especially useful in determining the zones of the potential failure that are most in need of attention. 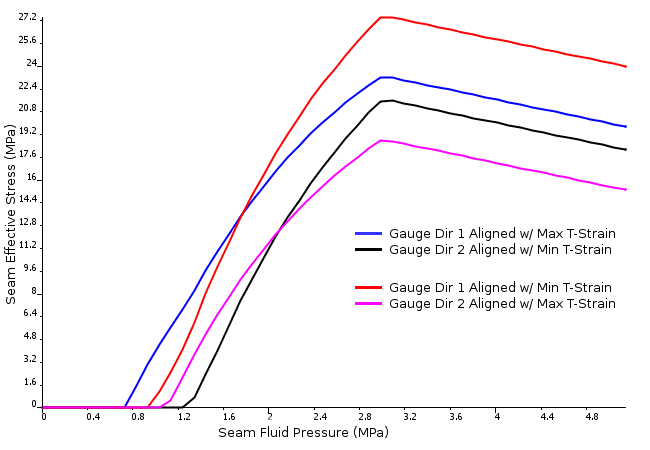 This version may be used integrally with the Sigra groundwater model for inflow on a slope. The model may be run on its own or with real time groundwater inputs to yield a real time factor of safety for a slope. Sigra also has a number of wedge and planar failure models for use on rock slopes. In addition the company has developed a model to determine the spacing of sub horizontal drains in a slope. Sigra has a finite element solution package that can model sequential excavations in rock. The key to Sigra’s models is a correct initial stress distribution, generally based in sedimentary strata on gravitational load followed by tectonic strains.